Every Halloween, “The Monster Mash” by Bobby “Boris” Pickett makes a comeback. It topped the Cashbox Magazine Pop Chart for three weeks during late October and early November 51 years ago. It sold over one million copies in the process. But what was going on at the bottom of the charts 51 years ago. Enter Bobby and Larry Black. There were primarily country musicians for most of their career. Bobby played with the likes of Commander Cody, The New Riders Of The Purple Sage, and Asleep At The Wheel. They both played with Johnny Cash and Barbara Mandrell. Early in their careers, they formed a number of groups and released several singles. The Tripletts (Dore label), The Five Whispers (Dolton), The Tides (Dore), The Green Beans (MGM), and The Country Cut-ups (Mercury) were all products of the Black Brothers. It was The Five Whispers that almost brought them some fame. 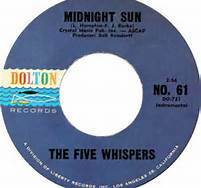 They released the single “Midnight Sun” in 1962 and on October 20, 1962, it made its Cashbox debut at number 100. One week later it moved up a notch to number 99 and then disappeared. 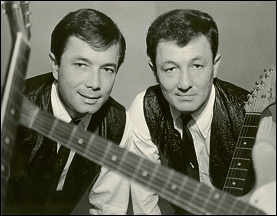 While they were country artists, “Midnight Sun” fell into the surf instrumental category. I don’t know how many surf songs featured a steel guitar but Bobby Black used it as the lead instrument. They were supported by drummer Jack Greenback. Time has regulated the record to collector conventions and Ebay listings but just over a half century ago, The Black Brothers appeared on the Cash Box Charts. You are currently browsing the archives for the Bottom Of The Charts Reviews category.